This healthy chicken dish is delicious. 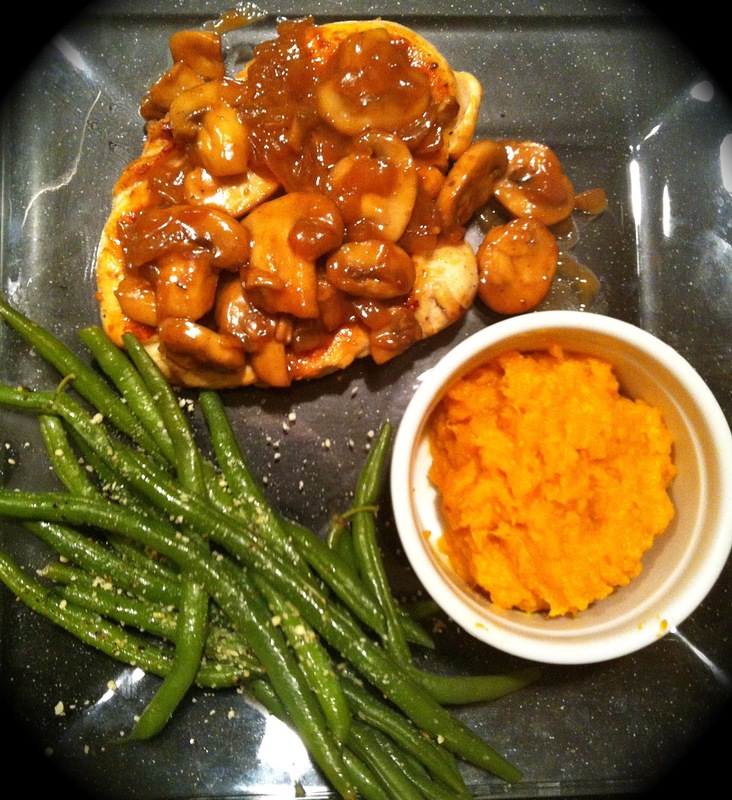 The mushroom sauce brings a hearty flavor to the chicken breast. I got this recipe from cooking light (link below). On their site they serve the chicken over mashed potatoes, but I decided to serve it with mashed sweet potatoes and green beens to make it a little healthier. You can find my mashed sweet potato, and green bean recipe under Starters/Sides/Snacks. Place chicken between 2 sheets of plastic wrap and pound until about 1/2 inch thick. Heat a large skillet over medium-high heat. Add olive oil to pan. Sprinkle the chicken with 1/4 teaspoon salt and pepper. Add the chicken to the pan and cook 3 minutes on each side or until done. Transfer chicken to a serving platter, keep warm. Add shallots and mushrooms to the skillet and saute for 4 minutes or until browned. Add garlic and saute for 1 minute. Stir in the wine, make sure to scrape the pan to loosen the brown bits. Bring to a bil and cook until the liquid almost evaporates. Sprinkle remaining 1/4 teaspoon salt and flour to the mixture and cook for another 30 seconds, stirring frequently. Add the broth to the pan and bring to a boil. Cook 2 minutes or until slightly thick. Remove the pan from the heat; add butter and tyme and stur until the butter melts. Serve over chicken.